Peregrine falcons are similar in size to crows and are known for their incredible flight speeds. When pursuing prey, peregrines can reach speeds of up to 180 mph, a rate rarely topped by any other bird. Adult peregrine falcons can be identified by their slate grey top and light underside, the latter of which features dark spots and bars. Long, pointed wings, a narrow tail, yellow legs and feet, and a black mark below each eye round out the primary characteristics of peregrine falcons. The wingspan of adult peregrines is approximately 40 inches, and males in the species are typically 1/3 smaller than their female counterparts. 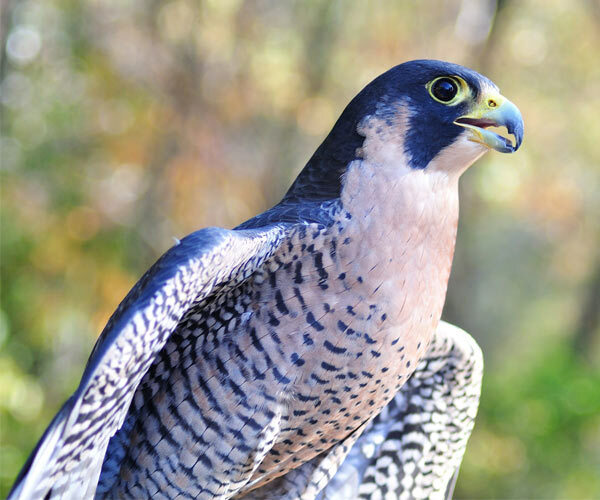 The peregrine falcon population in New York State began experiencing a decline in the 1940's due to the overuse of DDT and other pesticides and chemicals. The substances cause eggshells to thin, thereby impacting the number of chicks successfully produced from each breeding cycle. While there were once more than 300 breeding pairs in the eastern part of the United States, by the 1960's, every single pair was gone. DDT was banned from New York State in 1971, and shortly thereafter, a peregrine falcon reintroduction program was initiated. A technique called "hacking" - bringing nesting peregrines from other locations to New York and releasing them in order to repopulate the state - was used starting in 1974, and in 14 years, 159 peregrine falcons were released here. Hacking also proved to be successful in bald eagle restoration efforts. While the peregrine falcon population is growing in the Adirondacks and the New York City area, it is still small and fragile. In particular, rock climbing near the species' nest sites can lower the success rate of a breeding cycle, further endangering the population. Because of this, some climbing routes must be closed during the falcons' breeding season. The Department of Environmental Conservation has been closely monitoring peregrine falcons in the state, and as of 2015, there were 15 confirmed active nesting pairs in the Adirondack Mountains and along Lake Champlain and Lake George. An average of 1.2 young/breeding pair were produced by those 15 pairs. The DEC will continue to protect the species until the population has been restored to full strength.